Rules regarding the plural form of nouns seem to be pretty straightforward in English. Simply add an –s to the noun and you’re getting there. Of course, there are certain exceptions to this general rule. However, we don’t want to elaborate on irregular plural forms in this article, but rather expand on a specific plurals issue that seems to confuse many native German speakers. Namely, the fact that there are several English nouns which are used exclusively in their plural form. Here is an introduction to them. Sounding quite odd to native German speakers’ ears, some English nouns are always plural in form. 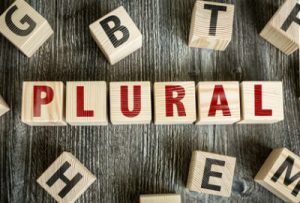 Making matters even more intricate, these plural nouns may either take a singular or a plural verb. Jeans: Native German speakers tend to think/say to own “one jean” or “two jeans”. In English, jeans are always used in the plural (e.g. “Where are my jeans?”). If you want to combine the word jeans with a number, you should say: “I bought three pairs of jeans”. Glasses: Another word that the German language provides in a singular as well as a plural form. It’s easier in English. There is no single glass, but only glasses (e.g. “I’m lost without my glasses”). Other nouns in this category are binoculars, headphones, pajamas, pants, scales, scissors and shorts. Now, let’s move on those strange plural nouns that are used in connection with a singular verb. Many sports fall into this category, such as athletics, billiards, darts and gymnastics (e.g. “Billiards is played all over the world”, “Darts is a popular game in bars in the UK”). Also, a lot of academic disciplines (economics, mathematics, physics) have a fixed plural form and take a plural verb (e.g. “Physics is said to be difficult”). And another quite important noun that you should remember in this category are the news (e.g. “The news starts at 8 pm”). Here are some more English nouns which are always used in the plural. Belongings: Everybody who has been on board of an airplane has heard the sentence “Please ensure that you take all your belongings with you as you leave the aircraft”. Clothes: Sometimes a little confusing for native German speakers, given that the German language knows a singular as well as a plural form of the word “clothes”. In English, clothes are always used in the plural form (e.g. “She bought some new clothes yesterday”). If you are talking about a single item, then you should use the term “piece of clothing”. Earnings, savings, wages: No idea, why these financial terms are always plural in form. Just take it as it is (e.g. “Wages are paid on the last day of the month”). Stairs: Another English plural noun that the German language uses in the singular are stairs (e.g. “The kids ran down the stairs”). Stair in the singular translates into the German “Treppenstufe”. People: Probably the most important English plural noun. If you are referring to several persons, you should use the term “people” (e.g. “Three people were arrested last night”). If you are referring to one person only, then say “person” (e.g. “One person was arrested last night”). Police: Sounding very odd to German speakers, the police in English is used as a plural term only (e.g. “The police arrested several suspects today”). Other nouns that only have a plural form in English are congratulations, likes/dislikes, goods, outskirts, premises, surroundings and thanks. Some nouns refer to groups of people, such as audience, committee, crew, enemy, government, public or team. That is why they are usually called collective nouns. Now the hard part is that these collective nouns can take a singular or plural verb, depending on whether they are considered as a single unit or as a collection of individuals. Sounds complicated – let’s explain that by giving you an example. “The audience was larger than expected” – in this sentence the audience is seen as a single, indivisible unit. “The audience were giving standing ovations” – in this sentence the audience is seen as an entity of individuals. One more example to clarify the use of collective nouns. “Manchester United is the world’s most popular soccer club” – here ManU is seen as the club itself. “Manchester United are looking forward to meeting Real Madrid in the Champions League final” – means that each and every single ManU player is excited to play Real. Another particular feature of the English language is the fact that several nationalities are written in the plural (without an –s). So, please say the British, the Dutch, the English, the French and the Welsh. The singular form of the English is an Englishman. Likewise, somebody from the Netherlands is a Dutchman. This entry was posted in Grammar and tagged nouns, plural. Bookmark the permalink.